OpenTBL provides the best open source software to bring the effective and engaging TBL pedagogy to your online course - all while saving you time and increasing student satisfaction. Electronically create and disseminate individual and team Readiness Assurance Tests (iRAT/tRAT), Peer Evaluations, and application exercises. No more paper shuffling, mis keyed forms, or manual scoring. Access modules anytime, anywhere. Support for desktops, tablets, and mobile devices. Pedagogically sound templates that streamline the building process for experienced faculty and jump-start the process for new faculty. Create once, use forever. Copy all your modules to a new course or term at the click of a button. OpenTBL is designed from the ground up to promote energizing team communication in an online environment. 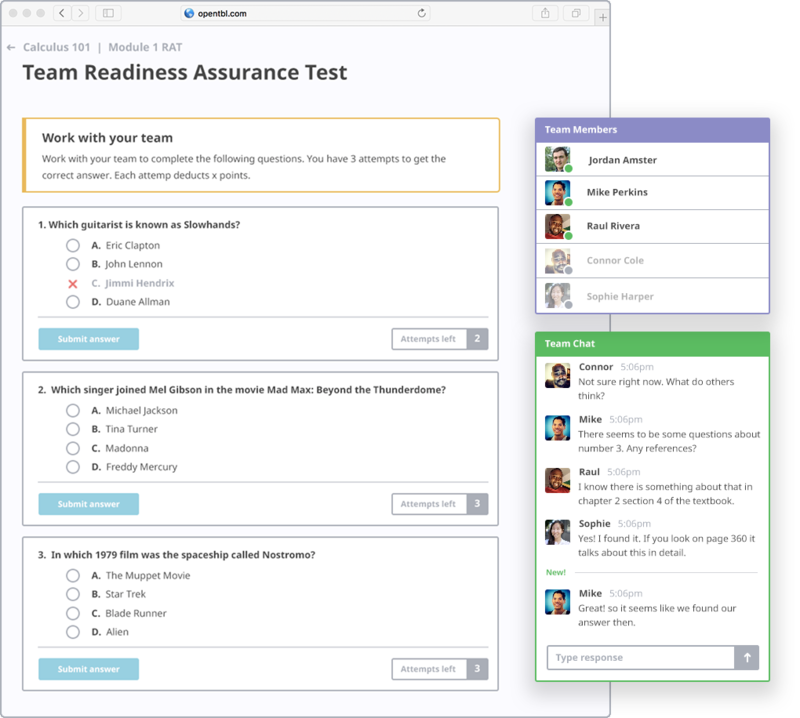 Specialized chat and archived messaging facilitate productive team decision making on complex and difficult questions. Automated, instant feedback is provided to deepen learning through further discussion and reflection. Follow along with your student’s progress. 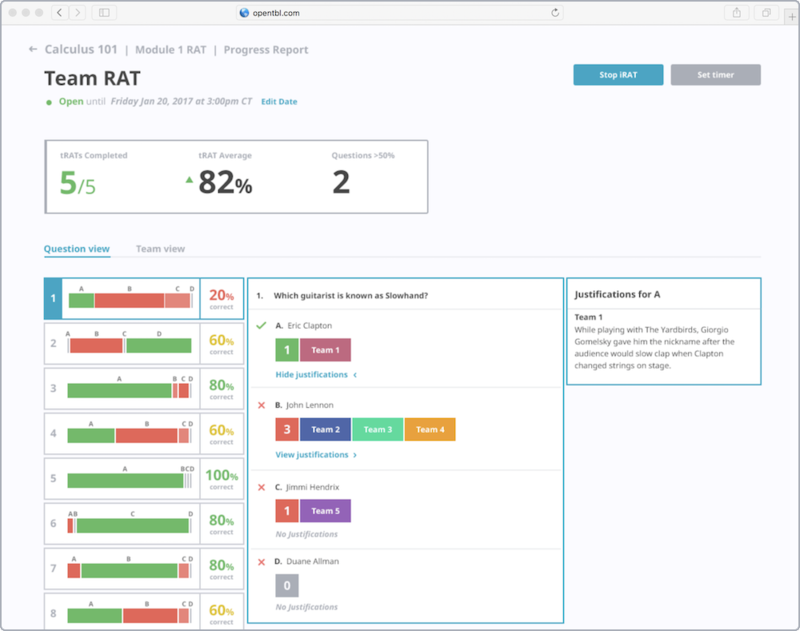 Configure your own thresholds to see where individuals and teams are falling behind in real-time to give them feedback at the right time. Pedagogically sound exercise templates to help you get started. 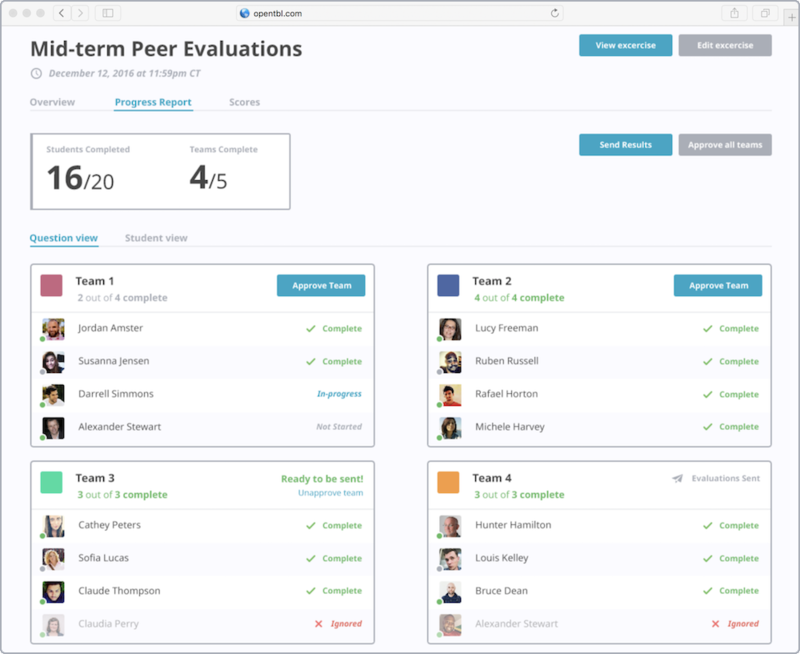 Distribute Peer Evaluations and results in seconds. Copy your exercises from semester to semester. OpenTBL is built by a passionate group of faculty, staff, developers, and designers that have collaboratively built and supported software for use at over 50 universities.